Neck and shoulder disorders may be linked to the presence of myofascial trigger points (MTrPs). These disorders can significantly impact a person’s activities of daily living and ability to work. MTrPs can be involved with pain sensitization, contributing to acute or chronic neck and shoulder musculoskeletal disorders. The aim of this review was to synthesise evidence on the prevalence of active and latent MTrPs in subjects with neck and shoulder disorders. We conducted an electronic search in five databases. Five independent reviewers selected observational studies assessing the prevalence of MTrPs (active or latent) in participants with neck or shoulder disorders. Two reviewers assessed risk of bias using a modified Downs and Black checklist. Subject characteristics and prevalence of active and latent MTrPs in relevant muscles was extracted from included studies. Seven articles studying different conditions met the inclusion criteria. The prevalence of MTrPs was compared and analysed. All studies had low methodologic quality due to small sample sizes, lack of control groups and blinding. Findings revealed that active and latent MTrPs were prevalent throughout all disorders, however, latent MTrPs did not consistently have a higher prevalence compared to healthy controls. We found limited evidence supporting the high prevalence of active and latent MTrPs in patients with neck or shoulder disorders. Point prevalence estimates of MTrPs were based on a small number of studies with very low sample sizes and with design limitations that increased risk of bias within included studies. Future studies, with low risk of bias and large sample sizes may impact on current evidence. Neck and shoulder pain are common complaints that may significantly impact a person’s activities of daily living and their ability to work . In New Zealand, shoulder pain is the third most common musculoskeletal condition. Neck pain is the 4th highest condition in terms of years lived with disability . Within New Zealand, ACC reports the 12-month prevalence estimates for neck pain in the adult population lie between 30 and 50%, and accounts for 15% of the global burden of disease . Myofascial trigger points (MTrPs) are considered to be hypersensitive, tender areas over a taut band of muscle . They are palpable, produce localised and referred pain to other structures with mechanical stimulation [4, 5]. MTrPs can be further differentiated as active or latent . Active and latent MTrPs elicit local and referred pain, however active MTrPs also reproduce patient symptoms, whereas latent MTrPs do not [3, 4, 6]. Latent MTrPs may later become active [3, 7]. It is considered that both active and latent MTrPs can cause muscle imbalances, weakness and impaired motor recruitment, disrupting muscle function, and exposing joint to suboptimal loading . The theory of trigger points causing myofascial pain syndrome is controversial with limited external validity to support it . Despite that, physiotherapy interventions commonly target MTrPs [10, 11]. Active and latent MTrPs may contribute to neck and shoulder pain symptoms . In a study with small sample size, active MTrPs were found to present higher concentration of inflammatory mediators, neuropeptides, cytokines, and catecholamines if compared to latent MTrPs or other body regions with no MTrPs . Latent MTrPs were found to impact on motor recruitment patterns , accelerate fatigue  in agonist muscles, and seem to be linked to increased muscle activity of antagonist muscles . Patients with chronic, non-traumatic neck and shoulder pain were found to have higher prevalence of MTrPs when compared to healthy controls, with different distributions between muscles of two opposing anatomical structures . For example, active MTrPs were prevalent in the infraspinatus and upper trapezius muscles, whilst latent MTrPs were prevalent in the teres major and anterior deltoid muscles . Studies investigating shoulder impingement have reported active MTrPs in infraspinatus, subscapularis, supraspinatus, and pectoralis major muscles . Together, these findings suggest that MTrPs are likely to be present in different shoulder and neck disorders, and may vary in muscle distribution and type (i.e. active or latent). Knowledge of MTrP common locations at the neck and shoulder can help clinicians to optimally prescribe interventions to manage neck and shoulder disorders. To our knowledge no previous systematic review summarized findings from and assessed the methodological quality of studies assessing the prevalence of MTrPs in the upper quadrant (i.e. neck and shoulder disorders). A previous review focused on spinal disorders only, without assessing patients with shoulder disorders . Given the link between these structures (i.e. neck, scapula and shoulder), we deemed appropriate to conduct a systematic review assessing the upper quadrant. Therefore, the objective of this study was to synthesize the current evidence on the prevalence of active and latent MTrPs in subjects with acute or chronic neck and shoulder disorders. The specific aims were to: (1) identify the prevalence of MTrPs in neck, scapular and shoulder muscles; and (2) compare the prevalence of MTrPs in subjects with diagnosed acute or chronic neck or shoulder-related disorders to healthy controls. The protocol of this review is described in Additional file 1. A comprehensive literature search of databases including CINAHL, Embase, Pubmed, Scopus and Web of Science was completed on August 12, 2017. The search strategy used is presented in Table 1. Screening of reference lists from included studies was also performed. Articles were then exported into Endnote and duplicates were removed. The retrieved articles were screened for eligibility by title, followed by full-article screening. There was no attempt to access unpublished studies or supplementary ‘grey’ literature. Initially, two independent reviewers screened articles by titles, and a third reviewer was available if consensus was not achieved. Full texts of potential eligible studies were retrieved and assessed independently against the inclusion criteria by two reviewers (A.B., and P.M.). Discrepancies between reviewers regarding full text eligibility were resolved in a consensus meeting and a third reviewer (DCR) was consulted. The following study designs were included in this review: (1) full-text articles published in a peer-reviewed scientific journal; (2) observational, cross-sectional, or prospective studies assessing the prevalence of active and/or latent MTrPs in at least one group of adult subjects (> 18 years old) with a shoulder, scapular, or neck disorder (as diagnosed by the original study); and (3) inclusion of manual assessment of MTrPs in at least one specific neck, scapular or shoulder muscle. 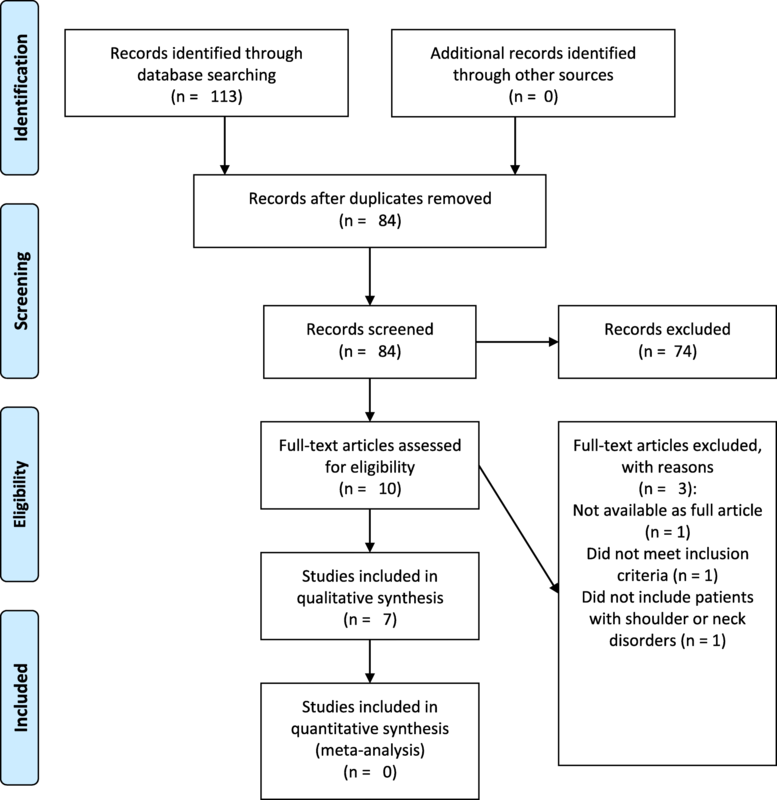 Articles in any languages and medical diagnoses indicating the presence of shoulder, scapular, or neck were accepted and included in this review. All study designs other than the aforementioned were excluded, unless randomised control trials included the prevalence of MTrPs as a baseline measurement. A modified Downs and Black checklist  was used to assess the risk of bias within included studies. This checklist is a 27 item checklist; however, 11 items were excluded as these were not applicable for this systematic review. Each study was assessed independently by 2 reviewers. Disagreements were resolved through consensus, if consensus was not reached, then a third author (D.R) was consulted. Studies scoring 50% or more were considered to have low risk of bias; whilst studies presenting with a Downs and Black score lower than 50% were considered to have a high risk of bias. For the purpose of this review, we arbitrarily selected a 50% cut-off. This threshold been used by a previous systematic review assessing observational studies . Characteristics from each study and additional patient and control group information were extracted and recorded. The proportion of participants with active/latent MTrPs in all assessed muscles were documented from each study. When available, we extracted information regarding the duration of the condition (i.e. acute or chronic). The data was independently extracted by two reviewers, and double-checked for accuracy. As each included study analysed a different disorder, it was not possible to conduct a meta-analysis. Therefore, a narrative discussion of findings is presented. The flow of studies in the review is presented in Fig. 1. Seven articles were included in this systematic review, with a sample size of 433 participants. Four studies had a cross-sectional design, while three studies used a case-control design. The risk of bias within included studies is presented in Table 2. Overall, studies were considered as having low risk of bias. There is some risk of bias for external validity. For example, subjects were considered as not representative of the entire population in three studies, and it was not possible to determine this in two studies (Item 8, Table 2). Risk of bias for internal validity was mainly due to participants not being recruited from the same population (Item 14 – Table 2) or due to lack of clarity about the recruitment period (not clear in four studies – Item 15, Table 2). Finally, three studies did not estimate sample size a priori. The included studies analysed the following disorders: chronic tension-type headache, chronic non-traumatic unilateral shoulder pain, non-specific upper quadrant pain, acute whiplash disorder, unilateral shoulder impingement syndrome and episodic migraine. For each disorder, MTrP prevalence was assessed in different muscles (e.g. upper trapezius, supraspinatus, sternocleidomastoid) (Table 3). The characteristics of the subjects included in the studies is presented in Table 4, and the point prevalence of active MTrPs in subjects with shoulder or neck disorders is presented in Table 5. 1) Presence of a palpable taut band in a skeletal muscle. 2) Presence of a hyperirritable sensitive spot within the taut band. 3) Local twitch response elicited by the snapping palpation of the taut band. 4) Presence of referred pain in response to MTrP compression. 1) A nodule in a taut band of skeletal muscle. 4) Production of referred pain in response to MTrP manual compression. 1) Presence of a palpable taut band within a skeletal muscle. 2) Presence of a hyperirritable spot in the taut band. 3) Local twitch response elicited by the snapping palpation of the taut band (when possible). 4) Presence of referred pain in response to compression. MTrPs were considered active when the local and referred pains evoked by compression reproduced clinical pain symptoms and also the participant recognized the pain as familiar. MTrPs were considered latent when the local and the referred pain elicited by digital compression did not reproduce symptoms familiar to the participant. Spain, Department of PT, OT, rehab and physical medicine. 5) If the MTrP were palpated and produced a headache, familiar or not, it was referred to as an “active MTrP”. 5) If the MTrP were palpated and produced local or radiated pain it was referred to as a “latent MTrP”. Alonso-Blanco et al. (2011) analysed the prevalence of active MTrPs in dominant and non-dominant temporalis, upper trapezius, sternocleidomastoid (SCM), and bilateral suboccipital muscles . The sample contained 20 adults and 20 children with chronic tension-type headache. Results showed adults had a significantly (p = 0.001) higher number of active MTrPs (4, SD = − 0.8) than children (3, SD = − 0.7). Significant differences in the distribution of active MTrPs between adults and children were found in the dominant upper trapezius (p < 0.001), and the non-dominant SCM (p = 0.032) muscles. This study had some external validity and power bias. Bron et al. (2011) reported on the prevalence of MTrPs in 72 subjects with chronic non-traumatic unilateral shoulder pain . This study analysed the prevalence of MTrPs on upper trapezius, middle trapezius, lower trapezius, infraspinatus, supraspinatus, subscapularis, teres minor, teres major, posterior deltoid, middle deltoid, anterior deltoid, pectoralis major, pectoralis minor, biceps, triceps, scalenes and subclavius muscles. Muscles containing active MTrPs were present in all participants, and the median number of MTrPs was 6 (range 2–16) per subject. Latent MTrPs were found in 67 participants with a median of 4 (range 0–11). Active MTrPs were most prevalent in the infraspinatus (n = 56) and the upper trapezius muscles (n = 42); whereas latent MTrPs were most prevalent in the teres major (n = 35), anterior deltoid (n = 27) and upper trapezius (n = 27) muscles. Although there was no difference found between left and right sides, this study demonstrated a high prevalence of active and latent MTrPs in muscles of patients with non-traumatic shoulder pain. This study had small reporting and external validity bias. Fernández-De-Las-Peñas et al. (2012) analysed the prevalence of active MTrPs in the head, neck an d arm between manual (blue collar) and office (white-collar) workers with nonspecific neck or shoulder pain . There was a similar number of MTrPs in the upper quadrant musculature with the most prevalent being upper trapezius, infraspinatus, levator scapulae, and extensor carpi radialis brevis muscles for both groups. No significant difference between groups was found with regards to the distribution of active and latent MTrPs, or the total number (p = 0.503) of active (p = 0.657) and latent (p = 0.605) MTrPs. Manual workers demonstrated a mean of 6 (SD = 3) active MTrPs, and 10 (SD = 6) latent MTrPs compared to the 6 (SD = 4) active and 11 (SD = 5) latent MTrPs shown in office workers . This study had some reporting, external and internal validity risk of bias. Fernandez-Perez et al. (2012) compared the prevalence of MTrPs in patients with a high level of disability following acute whiplash injuries with healthy controls . The distribution of MTrPs were statistically significant (p < 0.05) in the temporalis, upper trapezius, SCM, levator scapulae, scalenes, and suboccipital muscles between patient and healthy control groups. Active MTrPs in levator scapulae (p = 0.012) and upper trapezius (p < 0.01) muscles were more prevalent in the patient group when compared to healthy controls. When compared to healthy controls participant’s suffering from whiplash associated disorder (WAD) had significantly higher prevalence in the mean total number of MTrPs per person (7.3, SD = 2.8). Patients with WAD had a significantly higher number of active MTrPs per person (3.9, SD = 2.5). No active MTrPs were found in healthy controls (p < 0.001). Significant differences in latent MTrPs were also observed between groups (p = 0.002). Participants with acute WAD had a mean of 3.4 (SD = 2.7) latent MTrPs per person, whereas healthy subjects had a mean of 1.7 (SD = 2.2) . This study had some reporting, external and internal validity risk of bias. Hidalgo-Lozano et al. (2010) assessed the prevalence of MTrPs in 12 patients with unilateral shoulder impingement syndrome compared to healthy controls . On average each patient had 4.5 (SD = 1) MTrPs and of those, 2.5 (SD = 1) were active MTrPs and 2 (SD = 1) were latent. However, no distinction was made between left and right shoulders. Point prevalence of active MTrPs was most predominant in supraspinatus (67%), infraspinatus (42%) and subscapularis (42%). The distribution of MTrPs in muscles was also significantly higher in individuals with unilateral shoulder impingement syndrome in comparison to healthy controls. Differences in MTrPs between healthy controls and symptomatic participants were reported for the levator scapulae, supraspinatus, infraspinatus, pectoralis major, and biceps brachii but not subscapularis muscles. Both active and latent MTrPs were present in unilateral shoulder impingement participants with levator scapula (100%), supraspinatus (66%), infraspinatus (83.33%), and subscapularis (66%). This study had some reporting, external and internal validity, and power risk of bias. One study assessed the presence of active and latent MTrPs in patients with cervical radiculopathy . The muscles assessed included trapezius, multifidus, splenius capitis, levator scapulae, rhomboid major, and rhomboid minor. A total of 244 patients where compared to 122 controls. Findings suggest that active MTrPs are more common on patients with cervical radiculopathy than controls. Participants on the control group did not present active MTrPs on assessed muscles. The study also reported no difference between groups (control and cervical radiculopathy) in the distribution of latent MTrPs (p = 0.249). This study had some reporting, external and internal validity, and power risk of bias. Tali et al. (2014) studied two groups with the first (18 women and 2 men) suffering from episodic migraines and the second (17 women and 3 men) being healthy controls . Results from this study revealed an increased number of active MTrPs in the migraine group when compared to healthy controls. No significant difference (p = 0.185) between groups was found for the prevalence of latent MTrPs. That study identified a higher prevalence of MTrPs (active and latent) in the migraine group in the right trapezius in comparison to the control group . There was no significant difference in MTrPs between left and right side migraines. This study had some reporting, external validity, and power risk of bias. This systematic review aimed to synthesise evidence on the prevalence of active and latent MTrPs in neck or shoulder disorders. Seven studies were included, each study focused on different populations and conditions. All studies scored 9/16 or higher on the modified Downs and Black checklist, suggesting an overall low risk of bias within included studies. We have identified risk of reporting, external and internal validity and power bias in included studies. The included studies examined the following musculoskeletal disorders: chronic tension-type headache , unilateral shoulder pain , upper quadrant pain , acute whiplash disorder , shoulder impingement syndrome , cervical radiculopathy , and episodic migraine . Hidalgo-Lozano et al. (2010), Fernandes-de-las-Penas et al. (2012), Fernandes-Perez et al. (2012), and Tali et al. (2014) all compared participants with shoulder or neck disorders to healthy controls and found participants with shoulder and neck disorders had a higher prevalence of MTrPs [17, 21, 22, 24]. Active and latent MTrPs are more common in the upper trapezius muscle, with the exception of Fernández-De-Las-Peñas et al. (2012) who found no significant difference between the distribution on active or latent MTrPs . Alonso-Blanco et al. (2011) and Bron et al. (2011) compared the prevalence of MTrPs between adults and children and the prevalence between right and left shoulders in patients with unilateral shoulder pain respectively [5, 20]. Alonso-Blanco et al. (2011) found that adults had higher prevalence of MTrPs than children, whilst in contrast Bron et al. (2011) found no significant differences between symptomatic and asymptomatic shoulders . All studies, with the exception of two [20, 23] had very small samples sizes. Therefore, the generalisability of results is limited. Bron et al. (2011) and Sari et al. (2012) had the two largest sample sizes (72 and 244 patients respectively) from all 7 studies [20, 23]. However, Bron et al. (2011) study had 69% female participants and did not include a healthy control group which decreases the significance of their findings . Bron et al. (2011) and Hidalgo-Lozano et al. (2010) did not differentiate between the prevalence of left and right MTrPs and they did not acknowledge which side was symptomatic [17, 20]. This made interpreting results more difficult and hindered the synthesis of data from multiple studies. Studies presented limitations regarding sample size and assessor blinding. All studies were considered to have small sample sizes . A small sample size can lead to biased results. Future studies with larger sample sizes should be designed, and estimated a priori, to ensure more reliable and accurate findings. Only four studies ensured practitioners assessing trigger points were blinded. Blinding the assessor helps reducing the influence of the assessors’ perception and believes towards an outcomes measure . Only 4 of the 7 studies included a control group. Findings from control groups inform what outcomes are expected within an asymptomatic population. Additionally, the inclusion of a control group helps to control for other variables (e.g. age, occupation), and also accounts for normal biological variations . Future studies should therefore include a control group, to enhance our understanding on the role of MTrPs and musculoskeletal disorders. There is lack of consensus on how to define myofascial trigger point pain syndrome . The use of different definitions, or the lack of clarity around MTrPs definition, impact on the external validity of reported findings. Included studies used similar (but not always the same) diagnostic criteria for assessing active and latent MTrPs. Currently, the criterion validity of MTrPs diagnostic criteria is poor, as there is no gold standard for diagnosing MTrP. Therefore, it is unknown what the sensitivity and specificity is when using the clinical criteria proposed by Simons et al. . The reliability of physical examination for diagnosing MTrP has been questioned in the literature . One study reported excellent test-retest reliability for physical examination when assessing MTrPs in patients with rotator cuff disorders . On the other hand, two previous systematic reviews [30, 32] questioned the reliability of physical examination for assessing the presence of MTrP due to low methodological quality of included studies. There is definitely a need for an international consensus for standardizing the assessment of MTrP in clinical practice and research . All studies used very similar definitions to define a MTrP (Table 3). Most used the description from “Myofascial Pain and Dysfunction. The trigger point manual. Upper half of body” by Simons et al. The criteria often comprised: 1) presence of a palpable taut band within a skeletal muscle; 2) existence of a hyperirritable spot in the taut band; 3) local twitch response elicited by the snapping palpation of the taut band (when possible); 4) presence of referred pain in response to compression . The criteria for distinguishing between active and latent MTrPs were also defined by Simons et al. . The difference in active and latent MTrPs was found following compression of the MTrP. If patient’s symptoms were reproduced, it is considered to be an active MTrP; whereas no reproduction of symptoms or production of unfamiliar symptoms is considered latent . The results from this review suggest that active and latent MTrPs are highly present in patients with different neck or shoulder disorders. From the 7 included studies, 5 revealed that the upper trapezius was consistently one of the muscles with highest, if not the highest, prevalence of a MTrP. Furthermore, 3 studies examined the prevalence of MTrPs on infraspinatus muscle [17, 20, 21] and, together, these findings suggest that infraspinatus is among one of the most prevalent muscles with active MTrPs across all 3 studies. All seven studies reported the importance of referred pain mechanism relating to MTrPs, and how it may be an underlying contributing factor to the patient’s condition. Alonso-Blanco et al. (2011) found a significantly higher number of active MTrPs in adults and discussed the similarities observed between the presence of active MTrPs and patterns of their headache symptoms . Hidalgo-Lozano et al. (2011) revealed that the referred pain pattern from the active MTrPs of the levator scapulae, supraspinatus, infraspinatus, subscapularis, pectoralis major, and biceps brachii reproduced patient symptoms . This was also in agreement with Dong et al. (2015) and Koester et al. (2005) who reported shoulder impingement often refers pain down to the mid humerus level, further increasing the validity of MTrPs and their impact on the reported symptoms for this disorder [33, 34]. These studies support the idea that high active MTrPs may contribute to patient’s symptoms. We were unable to perform a meta-analysis due to patients with different disorders being included, and different outcome measures used by the included studies. Due to limited number of articles included in this review, we could not explore differences in the prevalence of MTrPs between acute and chronic conditions. We did not register the protocol of this review, and that increases risk of reporting bias of this review. A previous systematic review assessed the prevalence of MTrPs in spinal disorders . Findings from the review support the theory that MTrPs are more prevalent in patients with musculoskeletal disorders. Findings from this systematic review suggest that there is limited evidence supporting the high prevalence of active and latent MTrPs in patients with neck or shoulder disorders. Point prevalence estimates of MTrPs were based on a small number of studies with very low sample sizes and with design limitations that increased risk of bias within included studies. Therefore, future studies assessing patients neck or shoulder disorders, with large samples and stronger study designs are required to provide more reliable pooled estimates of point prevalence of MTrPs in these patients. The authors acknowledge the financial support from Centre for Health, Activity and Rehabilitation Research (CHARR), School of Physiotherapy – University of Otago. Daniel Cury Ribeiro is supported by The Sir Charles Hercus Health Research Fellowship – Health Research Council of New Zealand. DCR was responsible for the study concept and design of this review. AB, AN, HF, PM, SP were responsible for the study selection and assessment of risk of bias within included studies. All authors participated in acquisition, analysis, and interpretation of data. AB, AN, HF, PM, SP were responsible for drafting the first version of the manuscript. DCR was responsible for drafting the final version of the manuscript. All authors read and approved the final manuscript. Daniel Cury Ribeiro is a member of the Editorial Board of BMC Musculoskeletal Disorders. The other authors state no conflict of interest to declare.